In recent weeks, the ECCC’s Supreme Court Chamber (SCC) has made a series of announcements regarding the appeals against the Trial Chamber’s Judgment in Case 002/01. Some of its actions have come in response to three requests made by the Nuon Chea Defense Team for the SCC to obtain and consider additional evidence and hear additional witnesses in the appellate proceedings. On 1 April 2015, the SCC decided to investigate if footage from a movie made by Thet Sambath and Robert Lemkin was available and relevant to the alleged murder of Lon Nol officials at Tuol Po Chrey, events for which the Trial Chamber found the Co-Accused criminally responsible. The SCC assigned two judges (national Judge MONG Monichariya and international Judge Chandra Nihal JAYASINGHE) as delegates to conduct this investigation and work with the Witness unit to contact Mr. Thet and Mr. Lemkin. This decision (F2/4/3) is found here and the redacted transcript of the two Judges’ 18 May 2015 interview of Robert Lemkin (F2/4/3/1) is here. 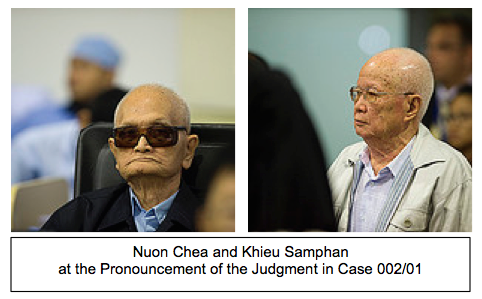 On 29 May 2015, the SCC decided to call three other witnesses requested by the Nuon Chea Defense to testify in appeal hearings. These witnesses have been given the pseudonyms SCW-3, SCW-4, and SCW-5. The SCC remains seized of Nuon Chea’s request for calling other witnesses, including THET Sambath, Robert LEMKIN, current National Assembly President and CPP President HENG Samrin, current CPP Senator OUK Bunchhoen, and two more pseudonymed witnesses, SCW-1, and SCW-2. The SCC will rule on these witnesses’ appearances at a later date. Read more about the decision (F2/5) and the specific reasons for calling these three Witnesses here. On 2 June 2015, the SCC ordered the hearing of SCW-3, SCW-4, and SCW-5 to be scheduled for Thursday, 2 July 2015 through Monday 6 July 2015, with Tuesday, 7 July 2015 noted as a reserve day, as proceedings require. The Chamber will also hear the report of the delegate judges who were assigned to investigate the evidence of Thet Sambath and Robert Lemkin. See that order (F24) here and read the Public Affairs Section’s notification about registration and accreditation for public attendance of the first SCC appeal hearings in Case 002/01 here. The SCC is expected to organize appellate hearings for the Parties to make oral arguments in due course. In the meantime, Judge KONG Srim, the President of the Chamber, today appointed three sets of Co-Rapporteurs among the SCC Judges to focus on specific aspects of the appeals of the two defense teams and the OCP. Read about those appointments in the order (F25) here.